Confession: I’m not a big baker. I l.o.v.e. to cook [like this lick-the-bowl potato leek soup], but I’m not too big on baking in general. The big exception to the rule, though, is banana bread. Everyone around here goes crazy for it – myself included. We eat it so quickly, we’re lucky if we can get a loaf to last more than 24 hours before it’s been devoured. I have had a recipe that I’ve used pretty consistently over the past few years [thank you to my dear sister-in-law Lisa!] But as much as I loved it, I wanted to make it my own – and to try to make it a little healthier. So after some experimenting, I think I’ve settled on a recipe that I’m really happy with – and happy to feed my kids. It’s low in refined sugar, packs a healthier punch than your typical banana bread recipe, and leaves everyone asking for another slice. Preheat your oven to 350 degrees. While it preheats, mix the dry ingredients in one bowl and the wet in another. Slowly combine the two, mixing them together thoroughly. Pour the batter into a greased loaf pan. Bake for 45 minutes or until you can insert a toothpick in the center and it comes out dry. Allow the bread to cool in the pan for at least five minutes [which will be ridiculously difficult, because it will smell so.darn.good.] before removing it. But this recipe doesn’t come without warning. Be careful, you might not be able to hold yourself back from eating the entire loaf in one day. Linking up to these par-tays! Previous postValentine Conversation Heart Garland: a Tutorial! I just made these! AMAZING! Thanks for the recipe. do you think regular oats would work? I never buy quick-cooking. ok, great! and yes, for sure. I blame lots on that myself. heehee. My kids aren’t picky about most things, but for some reason they don’t like quick breads. But they often love the same recipe in the form of mini muffins (weird, huh?) I made your recipe into mini muffins and it worked great. I’m excited to have another option for snacks/lunch boxes/etc. Thanks! I made this yesterday and it was pretty good. After sitting for less than half a day it’s really good. It got more moist after I wrapped it up (like banana bread seems to always do). It’s not as sweet as some banana breads I’ve made but still really good. I added walmuts to mine which I like. Thanks for the healthy recipe! thanks, christy! 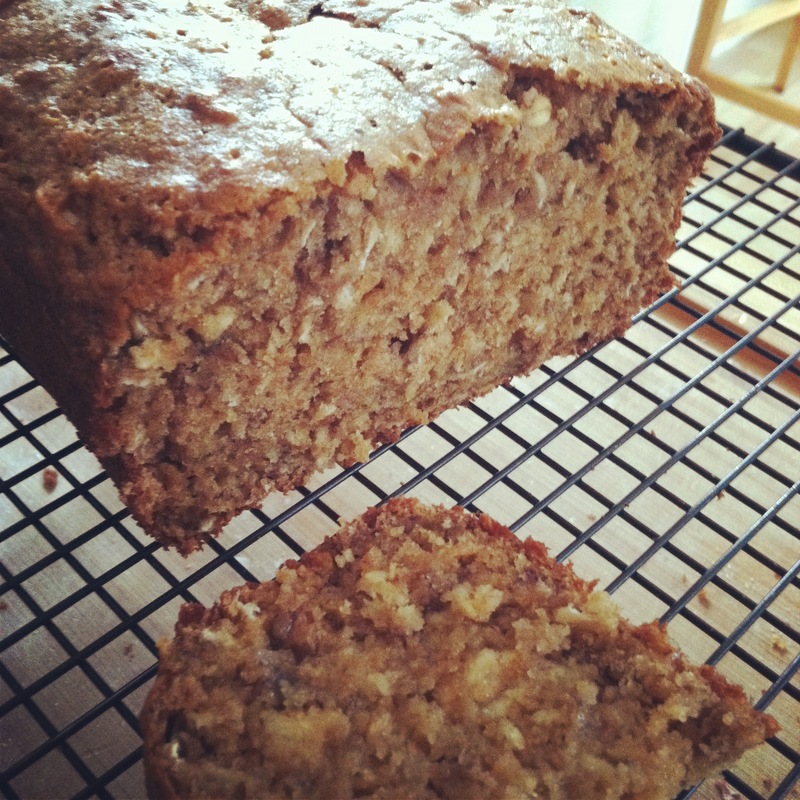 yes, it isn’t as sweet as most banana breads – but i like that about it. we also don’t eat a lot of sweets, so it actually tastes sweet to us. :) glad you enjoyed it! I found this recipe this morning and thought this could be interesting. So I made it and it is delicious! You are right, it is not as sweet as traditional, but it is healthier and very good. I will definitely made this again. Thanks for sharing this recipe with us! My husband LOVED IT! best recipe ever. He said “we found the one”. I just made this! I actually substituted the sugar with splenda brown sugar and added about 3/4 cup of chopped nuts. I also used a muffin pan instead of the loaf pan. DELISH!